Managers of RVIPF’s newest corporate partners Digicel BVI (L-R) Kevin Smith, Jayne Gray and Matthew Daly pose for a photo with Commissioner of Police David Morris following Force Lecture and Commendation Luncheon. 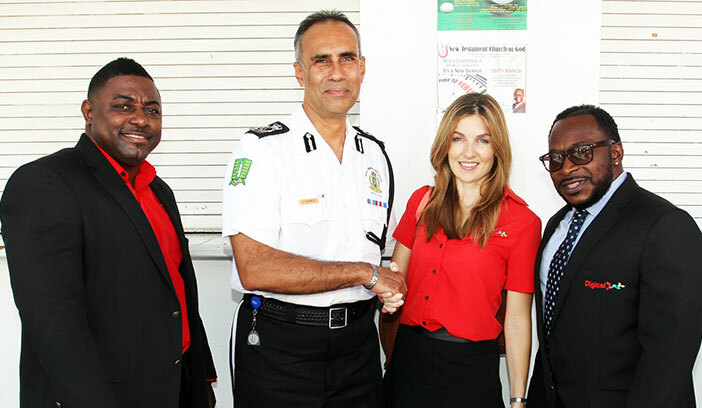 Digicel is now partnering with the Royal Virgin Islands Police Force to promote law, order and safety of the public as its joining in marking this year’s Police Week celebrations. Chief Executive Officer for Digicel Conor Looney says the company will be using Digicel’s social media pages to circulate newly released public service announcements to reduce accidents and injuries on the Territory’s roads and to encourage persons to install tracking apps on their electronic devices. “We want to help the Royal Virgin Islands Police Force to get their messages out to the public about their responsibilities for personal safety, property safety and the safety of others at home or on the road ways. It helps us all if we do what is right therefore Digicel is happy to partner with RVIPF and the John Black, the cinematographer, in this effort not just now but in the future,” he said. Acting Commissioner Alwin James says he welcomes the endorsement and support of Digicel as it promotes a law abiding public. “We see Digicel’s contribution as a positive set in our efforts to partner with the corporate community and the public to promote safety and to prevent crime and disorder. We can only prevent crime and promote safety with the support of the public. We hope that Digicel will be the first of many who will come onboard with the Force in helping to ‘Empowering our Communities through Police Partnerships’ as this year’s Police Week slogan suggests. Today, during the annual Police Week Commemorative Lecture and Luncheon, Digicel awarded smartphones to both the RVIPF Outstanding Officer and the Outstanding Support Staff Officer for this year. The service provider will also be provided additional gifts and prizes at various events during the Police Week celebrations.